It was a typical summer day on Lake Superior on August 2, 2007, when the Moderate Resolution Imaging Spectroradiometer (MODIS) on NASA’s Terra satellite recorded the lake’s temperature. Warm waters fringed the southern shores, while cooler waters gather in the center of the lake. Cold waters were welling up from the depth of the lake along the northern shore. If you were to look at the lake a few weeks later, it would have an entirely different appearance. As fall settles in, bringing cooler temperatures, the lake cools until its surface is more uniform. 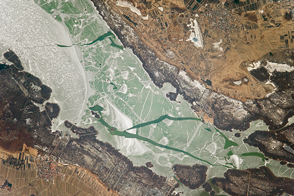 Winter brings a sheet of ice to all but the center of the lake, where winds break up any ice that forms. With spring, the ice retreats, and the waters begin to warm. River water, warmer than the cold, deep lake, flows into the lake, warming the water near the shore. As spring turns to summer, the entire lake warms, but since the waters near the shore have had a head start, they remain warmer than the center. The general pattern seen in this image—warm waters along the shore, particularly in the south, and cooler waters in the center—develops. 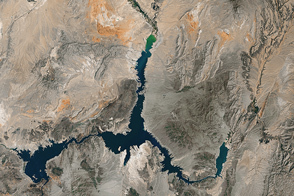 On August 2, it was clear that westerly winds had pushed the warmer surface water on the northwestern part of the lake away from shore, allowing deep, cold water to rush to the surface (dark blue strip along the shore). Unlike the cooler water in the center of the lake, there is a distinct line between the cold upwelling water along the shore and the warmer water to its south. The upwelling seen here may become a more frequent feature of Lake Superior’s circulation. A recent study of temperature and wind trends as measured by buoys on the lake found that both summer wind speeds and water temperatures increased between 1979 and 2006. An increase in wind speeds would lead to more upwelling. 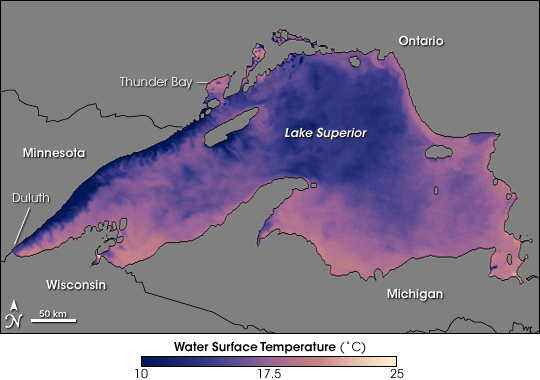 In their analysis of the measurements, Jay Austin and Steven Colman, both from the University of Minnesota, theorized that Lake Superior was able to warm up more because the spring melt is happening earlier. The water has more time to heat up, and so naturally, becomes warmer. If wind speed is increasing at the same time, the lake may be warming more than surface temperature measurements alone indicate. Increased wind-driven upwelling essentially stirs the waters of the lake, tucking heated water in deeper layers of the lake. Minard, A. (2007, August 3). Shrinking Lake Superior also heating up. National Geographic News. Accessed August 10, 2007. NASA image created by Jesse Allen, using data provided courtesy of the Ocean Color science tean. It was a typical summer day on Lake Superior on August 2, 2007, when NASA’s Terra satellite recorded the lake’s temperature. 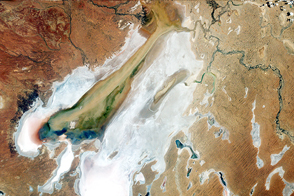 Warm waters fringe the southern shores, while cooler waters gather in the center of the lake. Cold waters well up from the depth of the lake along the northern shore.